Outlook has established itself as the most popular email application in the world over the last few years. In addition to emails, it also offers many other features like calendars, to-do lists, RSVP tracking, etc. However, it is important to understand that these problems, more often than not are related to data files in Outlook known as PST. And resolving issues with PST files will help resolve the Outlook problem as a whole. PST files contain all of your Outlook data like emails, contacts, calendar info, notes etc. Due to various reasons, these PST files can get corrupted and cause Outlook to malfunction. Let’s understand what causes corruption in PST files. Bad sectors: Hard disks usually develop bad sectors over time due to logical or physical damage. If PST files are stored in areas of the hard drive containing bad sectors, it can corrupt them and make the file inaccessible/unreadable. Oversized PST files: Every Outlook version has a certain PST file size limit and for Outlook to provide optimal performance, it is better if these files are within the size limit. However, since PST files are databases containing a lot of information, they tend to become large and if your file exceeds the size limit, chances of it getting corrupt are more. Storing PST files on a server: Server failures can occur due to hardware or software issues, system overload and various other reasons. If the server on which PST files are stored fails, then chances of corruption are more. Closing Outlook when PST is in use: Normally, when you are working with Outlook, PST files may be in use. Closing Outlook when PST files are being accessed may cause corruption issues. Virus attacks: Virus and malware attacks are known to cause corruption in PST files. This is one of the most common reasons for PST corruption. If you have experienced PST corruption issues due to one of these reasons or any other reason, it becomes important to repair the PST file to resume Outlook operations normally. 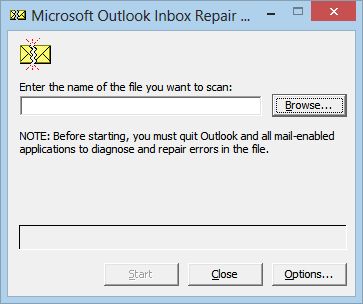 To repair your Outlook PST file , there can be 2 methods. One of the methods is using a readily available built in tool called ScanPST provided by Microsoft and the other is a dedicated PST repair software called Remo Repair PST. Both these methods will be covered in detail under the following subsections. The ScanPST method may be successful only for minor corruption issues in the PST file, but it may not work when your file is severely corrupt. Also, with ScanPST, you may have the risk of losing data because it works on your original PST file. To overcome these problems, a dedicated PST repair tool called Remo Repair PST can be used to repair PST files, explained in the next section. Remo Repair is a top notch PST repair software designed to repair all corruption issues in PST files whether it is simple or complex. It works using a unique technique that reads from your original PST and makes a copy, then repairs issues and produces a new healthy PST file. This way, it prioritizes safety and protects your original Outlook data from any modifications or damage. Along with fixing common Outlook errors, there are also other benefits that Remo Repair PST offers, explained in the next section. Equipped with powerful repair algorithms, Remo Repair Outlook (PST) can flawlessly conduct repairs on PST file that are very large and severely corrupt. Download a trial now! Why is Remo Repair PST the best choice to repair PST files? Has the ability to recover lost or deleted Outlook items like emails, contacts, calendars, notes etc. Watch the quick video tutorial to get an idea of the steps to repair PST files in Outlook 2016 using Remo Repair PST. Please note: You can use the same steps in the video to repair PST files in other Outlook versions like 2013, 2010 and earlier. As you’ve seen in the video, repairing PST files using Remo Repair PST is an easy and straightforward process. Please comment below if you have any questions or contact the tech support team that is available to assist you 24/7.